Here at doctorsnotestore.com we can supply you with a letter from a doctor explaining whatever you want. Frequently we get requests for doctors letters, or doctors notes to explain a variety of situations. Asking for discretion for exams, repeating exams due to an illness or bereavement in the family. 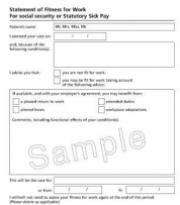 Declare a relative is ill, or undergoing an operation - to get a VISA or [unpaid] time off work. 4. Once payment has been made, we'll start work on your letter, and you can approve the drafts before copies are mailed (scans can also be emailed). Once you have made your payment, pop us an email at drsnotestore@gmail.com explaining the circumstance of the letter you need to be created, such as date, content of letter etc. 1. Pay Us £39.99 by Credit Card by clicking on the Pay Now by Credit Card Button above. 3. We'll make any necessary changes to the letter (medicalise the text etc.) and get the changes approved by you. 4. We print you letter on official Health Service Paper and sign and stamp it as needed - it arrives in the post to you with 24-48 hours. NB: This is a customised item: We regret that we cannot refund goods which are personalised, made to order or customised in any way, as they are not resaleable.